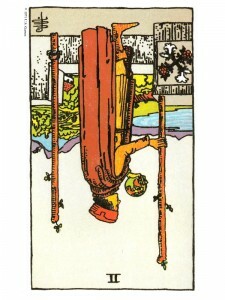 The Two of Wands (R) tells you that your true challenge is your own boredom – this lack of a new direction or stimuli. Have more patience, don’t spoil things by being over anxious – organize and bring order to your personal life. Clarify things in order to prevent any misunderstandings and do not allow anyone or anything to dominate your thinking. You have lived in this unpleasant, unsatisfying situation long enough – it is time to make a change! You are becoming confined by non – universal, puritanical and moralistic beliefs that inhibit your total personal expression and the liberation of your human potential. You will have the energy you need to move in new directions. Apply yourself – remain balanced and in harmony with the energy that surrounds you. When you jump into a new experience, leaving behind safe situations and past successes to enter the unknown – you liberate so much emotion and energy that you cannot avoid the wonder and enchantment or the fear that goes with it. Allow yourself to experience this freedom! There may be difficulty in taking this step, in understanding its implications, in choosing the correct discipline for yourself. There may be many choices competing for your dedication or it may be hard clarifying a choice already made. Some of what beckons you must be regarded with care, much as with the calls of sirens at sea. Pursue your visions with a discerning eye, ever cautious that the discernment does not deteriorate into discrimination. Next to Seven of Swords: Sort out your problems, you are experiencing an unnecessary disturbance involving this situation. In the first position: On one extreme this path will be very public and derive its tests of steadfastness and accuracy from those pressures. On the other extreme, there will be a necessity for a more private, perhaps lonely path. In the second position: There is still some confusion as to what you have committed to. Impact of spiritual commitments not fully taken advantage of. Clarify your spiritual marriage before laying more bricks. Some problem with the mechanics, the physical observations, rituals and such related to your path. In the third position: If this fork in your path seems radical, take the time you need and avail yourself of offered guidance to integrate the necessary changes into your habits. If, on the other hand, this fork is very subtle, do not misinterpret the subtlety for less importance. Minor adjustments are sometimes much harder to achieve than major ones. In the fourth position: Passion for path misleads some to reject an inclusive emotional approach. Another extreme is excess of passion for the path itself, evinced in excessive ritual or asceticism. Sometimes this passion is a rejection of a given path with which they have had an unpleasant contact. In the fifth position: This conscious decision has not been made in its final form. Perhaps it is even being delayed for some reason. In the sixth position: The number and/or intensity of emotional relationships and creative changes may be considerable. In the seventh position: Work hard to overcome your apprehension of taking the wrong step, of making the wrong pledge. You are signing up for the pleasure of the voyage, not its destination. In the eighth position: The quality of your discernment is in question. The disciplines appealing to you may be false mirrors and you may be dedicating yourself to someone else’s path, not yours. Inability to make a pledge or breaking one already made. Also, this can be the keeping of an improper or outdated oath. In the ninth position:: Subconsciously you may want this to take place, but it simply hasn’t kicked in yet, or – it may have kicked in and taken over. The heart must use this feeling, not lose itself in it. In the tenth position: You should remain with your present group a while longer. Either you are not yet ready for your intended projects or they are not yet ready for you. Listen closely for verification as to whether you are aspiring to the right disciplines, the correct path for you. A spiritual separation.